Jack Dorsey speaks to media, family members and colleagues while unveiling the Square Terminal. Square CEO Jack Dorsey says he aims to add more than 300 jobs in the company's St. Louis branch in the coming year — mostly in engineering, design and product development. 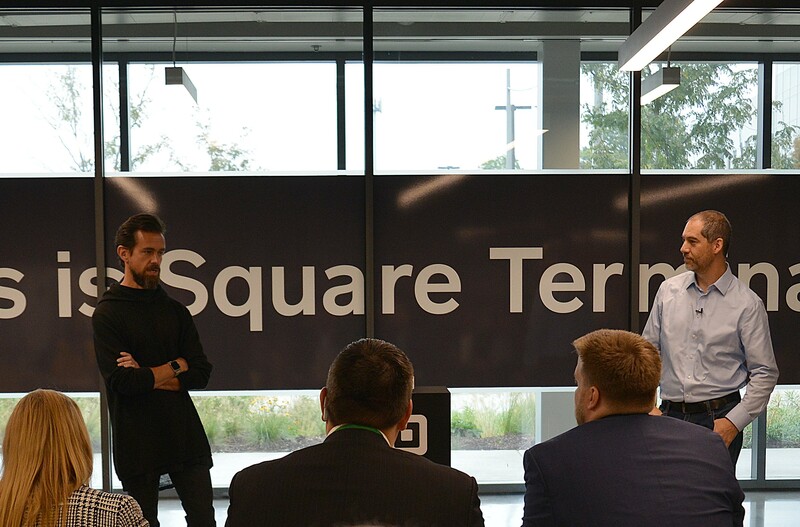 Dorsey, a St. Louis native, mentioned those plans during a press conference last Friday to promote the company's new product, Square Terminal. (The news was under embargo until today.) "That’s not a company goal, but for me personally, that’s what I would love to see and help make happen," Dorsey says. Four software engineering jobs have already been listed "within the last 90 days," says Jesse Dorogusker, Square's head of hardware. Square is currently housed in Cortex, a Central West End tech hub that houses LaunchCode among other startups and companies. However, Square and Dorsey indicated they have their eyes set on downtown in the near future. Dorsey says he asked Mayor Lyda Krewson in a private meeting, "If you were to point to an area that needs our help or where we could help the most, where in St. Louis city would it be?" Krewson's answer was downtown. Dorsey's interest in St. Louis should come as no surprise; the CEO's connections to the Gateway City were on full display during the Square Terminal's unveiling. 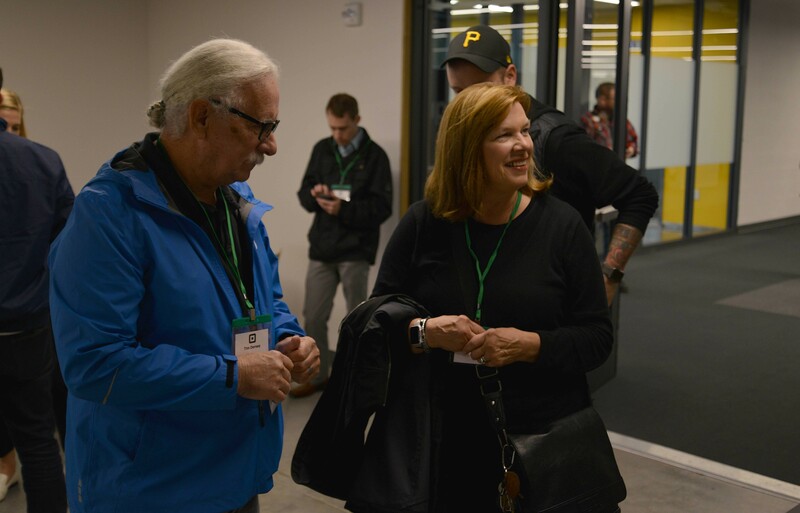 The event was attended by his parents, Tim and Marcia, and his brothers, even as Krewson personally thanked Square executives for their continued investments in St. Louis. Dorsey (who co-founded and is also the CEO of Twitter) even tweeted photos of himself at St. Louis favorites Lion's Choice and Sump Coffee during his trip to town, asking Twitter users if they wanted to meet up at the latter. "We lived in the city, we had a small business that Jack worked at," his mother Marcia says. "We had an open mold; we didn't mold him at all," Tim adds. The senior Dorseys have retained their St. Louis friendliness. Asked for their names, Tim Dorsey cautions a reporter that Marcia is "in the CIA," punning on her name's spelling. She in turn urges the reporter not to laugh at her husband's jokes as it only encourages him to make more. And like any native son, Jack Dorsey had some criticism for his hometown paper, the St. Louis Post-Dispatch. Between taking questions about the new Terminal, he told the newspaper, "I think it’s really important that we tell the positive stories happening in our communities and lead with that. Of course we need to report on what’s wrong and what needs to be fixed and what needs to be addressed, but the way you rank things and the way you prioritize your stories and your front page tells everyone what you consider to be most important." Across the room, Mayor Krewson echoed the sentiment with a muffled, "Amen." Tim, left, and Marcia Dorsey listen to local business owners rave about their son's new Square Terminal. 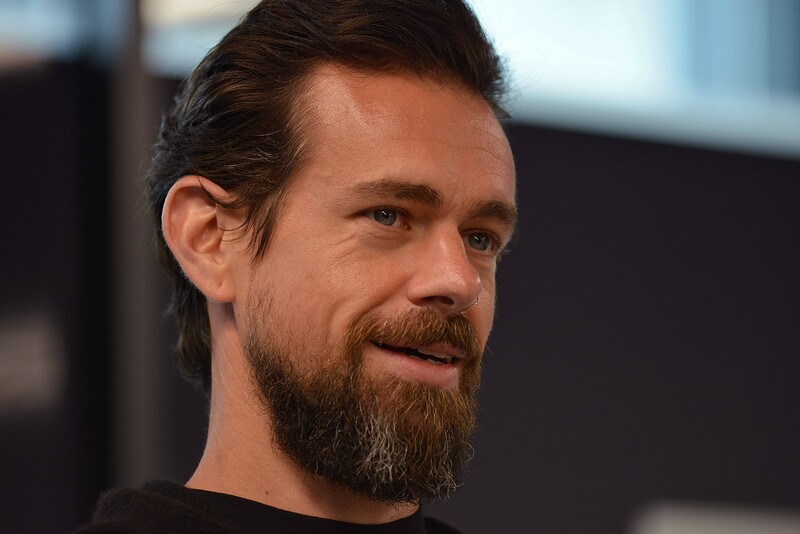 Square, which Dorsey founded in 2009, historically has provided payment processing services such as card readers to small businesses, but now seeks to go mainstream, supplying larger chains and stores with the Square Terminal and other products such as the Square Register. Square "is a company focused on economic empowerment," Dorogusker says. 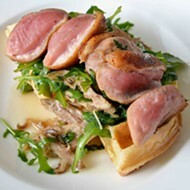 Its innovations could be a potential boon not only for the city's economic growth, but also for businesses based here. The Terminal is a sleek payment processor that allows manual payment entry for both online and in-store purchases. Its Wi-Fi connectivity allows it to be passed to a customer for signatures. Specs include a super-fast chip reader that promises to cut down on onerous wait times, compatibility with mobile payments such as Apple Pay and a built-in receipt printer that eliminates the need for the separate devices used by most stores. You could think of it as the iPhone of card readers. Two local businesses — DeMun Professional Cleaners and Isabee's Beekeeping — participated in the Terminal's beta testing. Both gave rave reviews of the product's versatility and expedited payment processing. 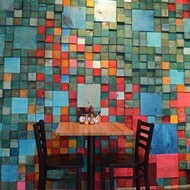 Square's ties to local business appear to be multiplying. "We're going to be building in St. Louis and investing in St. Louis for the foreseeable future," Dorsey says. Jack Dorsey, left, and Jesse Dorogusker unveil the Square Terminal, Square's latest development in payment processing devices. Square, "is a company focused on economic empowerment," Dorogusker says. 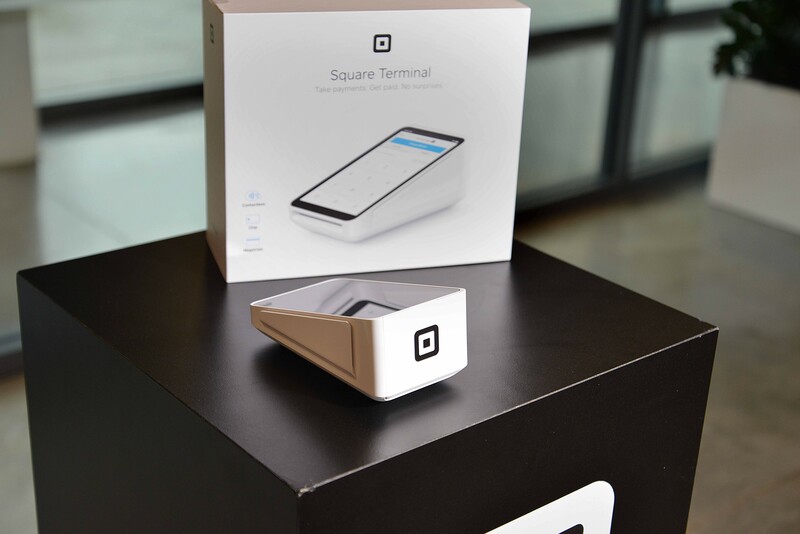 The Square Terminal is a sleek payment processor that offers versatility for merchants. It accepts online and in store payments, is cordless and Wi-Fi enabled.